Sound the klaxons, it’s a new indie alert! 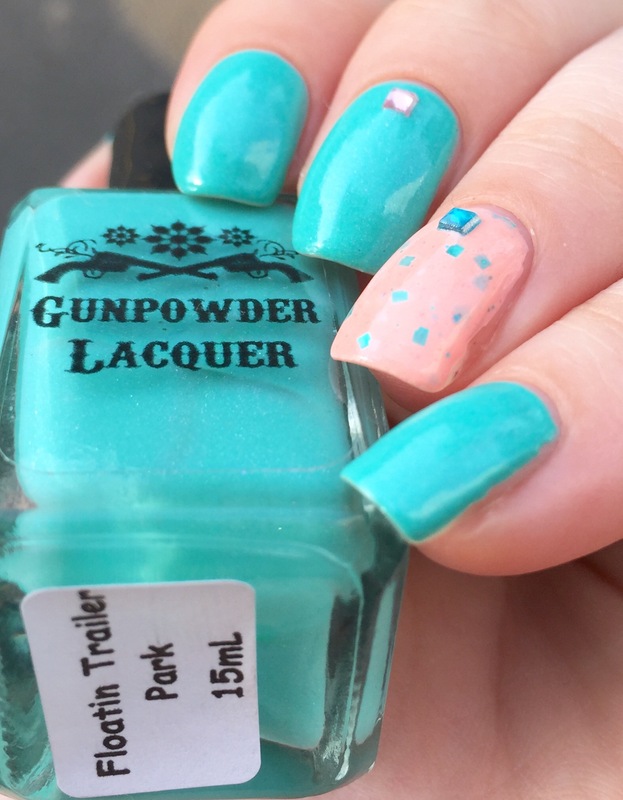 Today I have a polish from Gunpowder Lacquer, a brand new indie with an incredible initial collection! I saw the first swatches, full of vibrant colors and sparkly holos, and knew I wanted to try them out! So this is “Floatin Trailer Park,” the first [of many!] for me from this brand. 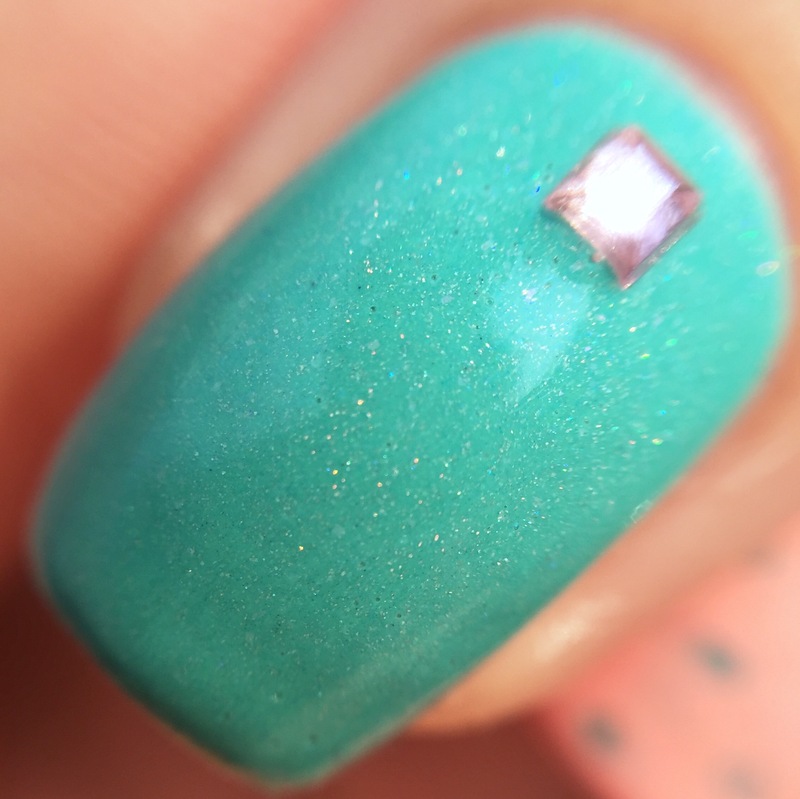 “Floatin Trailer Park” is a bright mint/turquoise (or aqua- I really can’t distinguish that whole color range) with a soft holo sparkle. 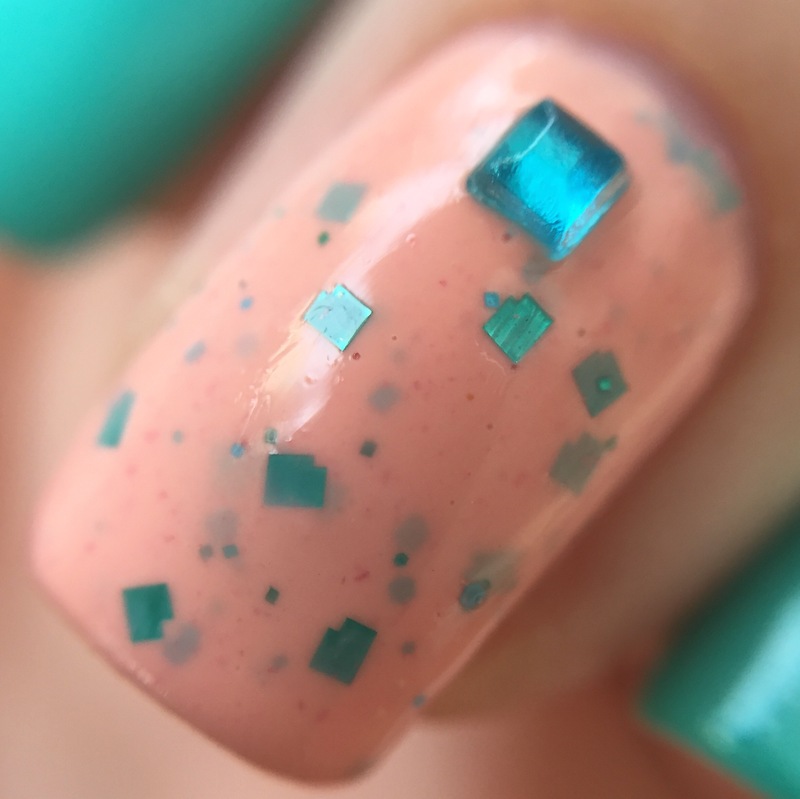 I paired it with Pahlish “Rosa Canina,” a peachy coral with teal metallic square glitters. I mostly picked this as an accent because the glitters matched “Floatin Trailer Park,” but the overall look is much more 50s diner than I was expecting. Is anyone else getting a retro vibe here? You’re looking at two coats of “Floatin Trailer Park” and three of “Rosa Canina.” The formula for the mint shade was a little bit tricky for me, but normal for such a bright, opaque polish. It was on the thicker side and evened out pretty well on the second coat. The thickness kept it from flooding my cuticles or getting everywhere (coloring within the lines has been a lifelong problem for me). As for “Rosa Canina,” the formula was as easy as all Pahlishes- opaque, self-leveling, and the perfect balance of glitter. I added little square rhinestones to play off of the square glitter and the colors of the accent. I’m thinking they definitely add to the retro diner feel. Check out the macros! 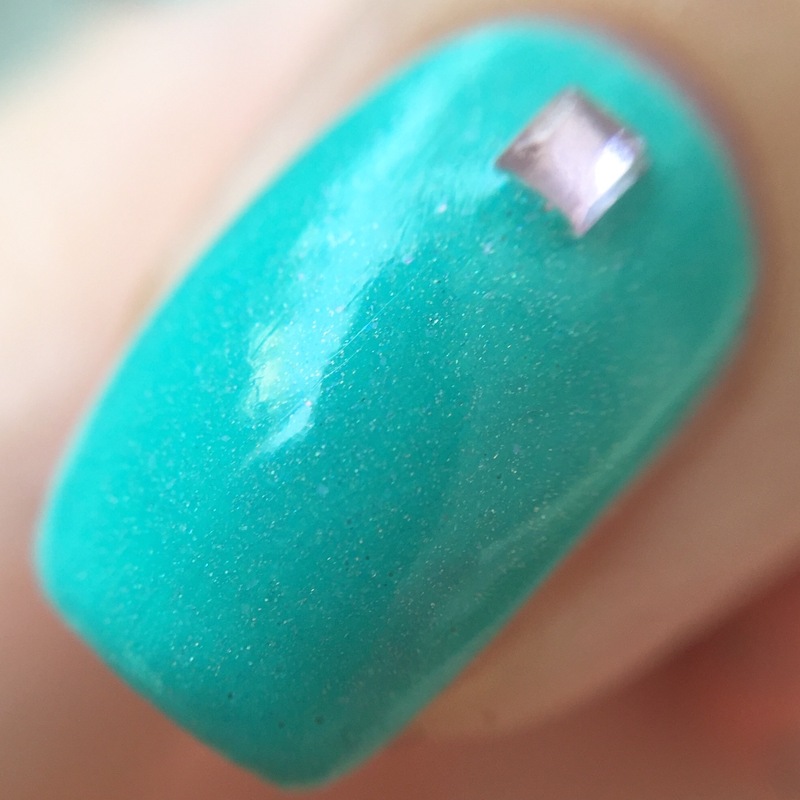 The first is in the shade and the second in direct sunlight (where you can see the soft holo). You can pick up “Floatin Trailer Park” and the rest of the “Sunshine & Whiskey” collection on Gunpowder Lacquer’s website. I highly recommend it- shipping was speedy and the packaging was adorable! My polishes can in a cute patterned cotton bag with a wooden tag. I would show you, but I’ve already repurposed it to holding glitter containers. I picked up “Rosa Canina” when Pahlish was re-releasing several older popular shades on her site, but it may be available from other stockists. I am so jealous of how good that peachy shade looks on you! Lovely color combo! 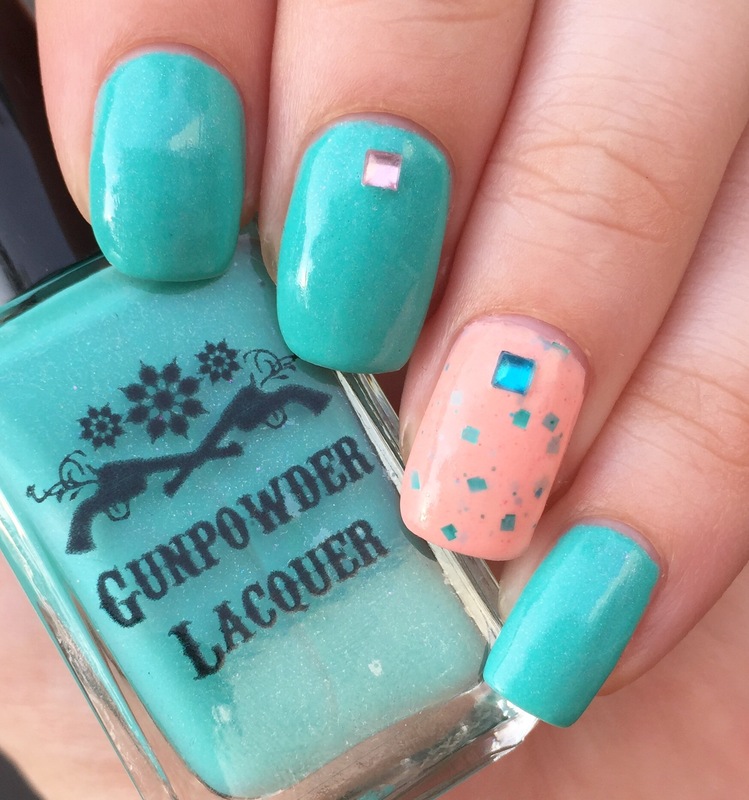 I missed Gunpowder Lacquer’s original launch and have been stalking all her social media for a restock date! Those polishes look like they were made to go together! Great combo! I ordered the mini set of the collection, it’s beautiful! Woah, I’m loving that Pahlish! The Gunpowder is lovely too, but Rosa Canina is calling my name! I’ve been seeing a lot of this brand lately, maybe I’ll try it someday. This isn’t a color combination that I would have thought to pair together but the glitters in Rosa match perfectly. It’s like they were made for eachother! I love this. I missed her launch because I was on a plane and by the time I landed, everything I wanted was gone. I think she’s restocking in a few weeks, so there’s another chance!